2 Masters w/King, 1 w/King, 1 w/2 Twins, 1 w/Pyramid and Trundle. Guest Linen Option. 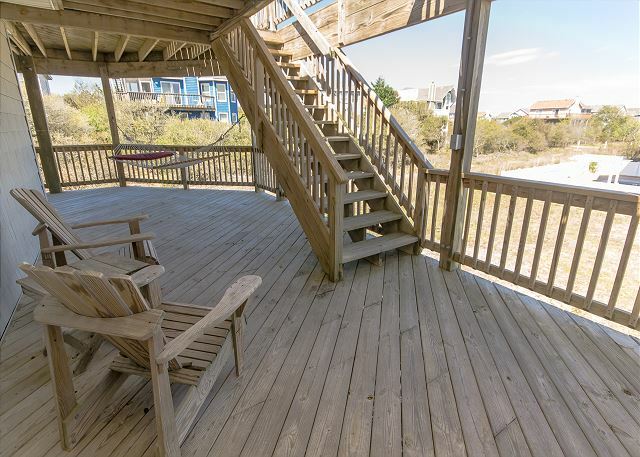 Gorgeous beach house, meticulously maintained with all the comforts of home and then some! Steps to ocean, less than a 2-minute walk! Many thoughtful touches, amenities. Enjoy the ocean breezes while relaxing top or mid level decking. Dine in the nicely furnished screen porch. 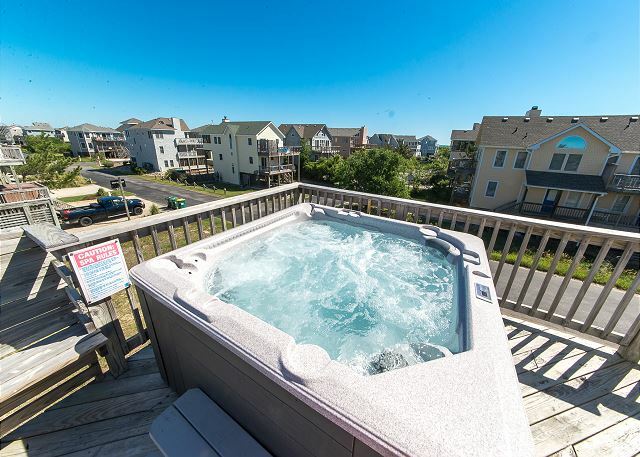 Watch the sunrise, the sunset, or the stars light up the night in the relaxing hot tub on the top deck. Steps to lovely, wide beach with dunes, sea oats. Chef’s well equipped kitchen. Professionally and beautifully decorated. We have many return guests who love our house, think of it as 'their own,' & rebook every year. We pride ourselves on constantly updating and maintaining our home for your comfort and relaxation. Perfect location! 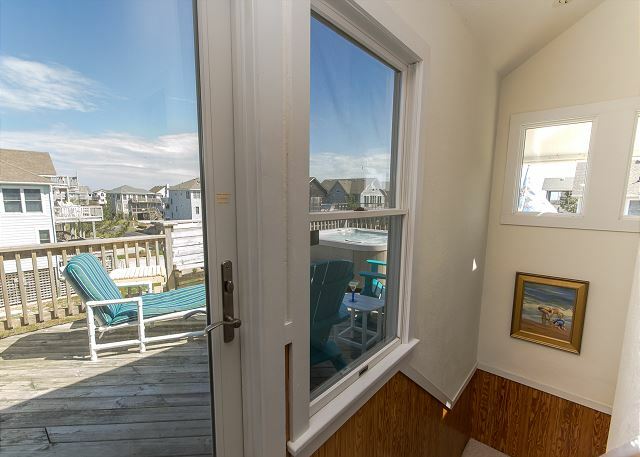 90 Second walk to the ocean, 1-minute drive to shopping, restaurants, 2-minute drive to Currituck Club premier golf, 5-minute walk to lake fishing and turtle feeding, 8-minute drive to beautiful sunsets on the sound at Currituck Beach Lighthouse. Free WIFI. Gas grill w/free refills and charcoal grill. Beach chairs/equipment provided. Non Smoking, Dog Allowed, Screened Porch w/Furniture, Gas Fireplace. Extensive covered and uncovered decking w/Furniture. Deck Swing and hammock. 7 person Hot Tub with 43 jets located on the upper deck with nice views. Short walk to lake where you can fish! 2 Pack-N-Plays. 3 High Chairs. BB Goal/Horseshoes. Bose CD/Radio. The outside shower has an awesome Rain Forest shower head. New in 2019: New 43" Vizio 4K, HDR, Smart TV in great room! Hook up your own Netflix, Amazon, etc. accounts here! New in 2018: New dishwasher, even more jazzy deck furniture, new portable Bose speaker! New in 2017: 3 New King Beds, New Hot Tub. Outside: Basketball Goal, Large Parking Area and Carport w/Space for 6 Cars, Fish Cleaning Table under Carport, Outside Rainforest Shower, Storage Area w/Numerous Beach Chairs/Umbrellas, Sand Toys, Etc., Gas Grill w/Free Refills, Charcoal Grill, Horseshoes in Back. Ground Level: Laundry Area w/Washer and Dryer. 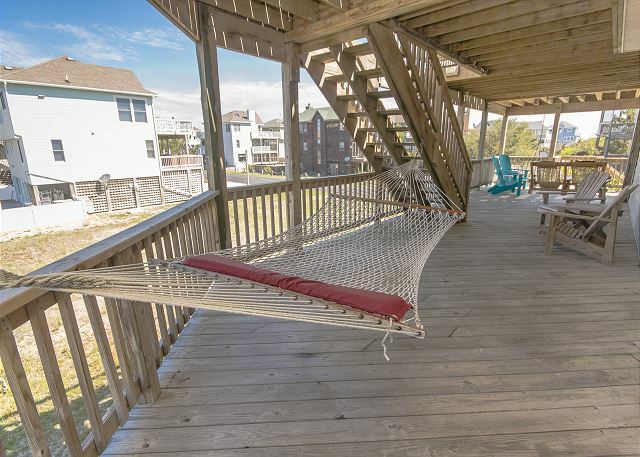 Mid Level: Extensive Decking, New 2- Two Person Swing and Hammock and Deck Furniture, Pyramid w/Trundle and TV/DVD , 2 Twins w/TV, Full Hall Bath shares entry w/King Bedroom w/Slider to Deck, w/TV/DVD, King Master Bedroom w/Full Bath and Slider to Deck and TV/DVD. Upper Level: Great Room, Gas Fireplace, TV/DVD, Bose CD/Radio, Extensive DVD Collection, Large Collection of Games/Puzzles/Books, Game Table w/4 Chairs and entrance to Furnished Screened Porch and Extensive Deck w/Deck Furniture, Dining Area w/Table Seats 8, Bar Seats 6, Master King Bedroom w/Full Bath opens to Deck and Hot Tub, TV/DVD combo, Hot Tub w/44 Jets on Upper Deck Level. SPECIAL DISCOUNTS FOR RETURN GUESTS: Return guests receive $150 off per week from June 17-August 5. For all other weeks return guests can book for $75 off per week. All two week guests receive these discounts per week as well. GUESTS RAVE: READ ALL OUR 5 STAR REVIEWS IN “REVIEWS” BELOW! This is an amazing Vacation Home in just the perfect area. Home was furnished wonderfully and exceptionally clean. We had 3 adult couples and really enjoyed our stay. We did add the linen package for the bedding and bath towels. Beach was just one and half blocks away and home had plenty of beach chairs we used. While in the area, there are two things that are a must see/do 1) Corolla Jeep Adventures - rent the Jeeps (2 available) and do the 6-8pm tour, one of the most amazing rides of our lives, dunes, wild horses and setting sun. 2) Outer Banks Boil Company - this is a take out boil - call ahead and place order - easy to fix back at the house (comes complete), Amazing meal !! 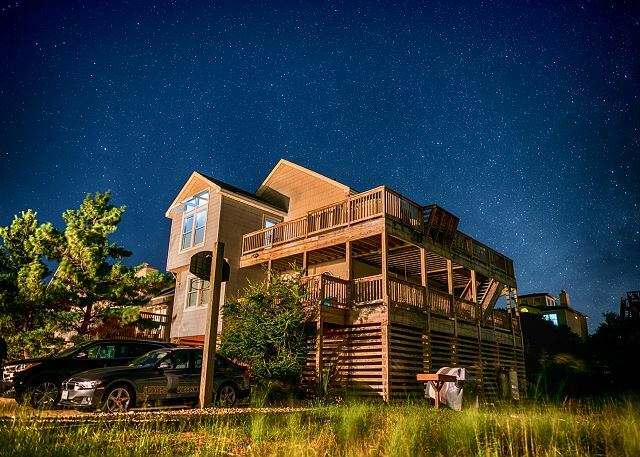 This was our first time to the Outer Banks and we will most certainly be returning to this home. Thank you for taking the time to leave us a such a wonderful review! We are thrilled that you enjoyed your stay with us and were able to enjoy all the island has to offer. Carolina in My Mind...always in my mind! Staying in Carolina In My Mind is always a peaceful, relaxing and enjoyable experience. The home is furnished with everything one would need and more when away from home. The short walk to the beach is easy and shopping is close by. We simply don't want to leave when our week is up. Exceptional value in prime Corolla location!! This home continues to exceed our expectations! The owners are always re-investing in the home to ensure the furnishings and condition remain enjoyable... year after year. Not your typical rental property. 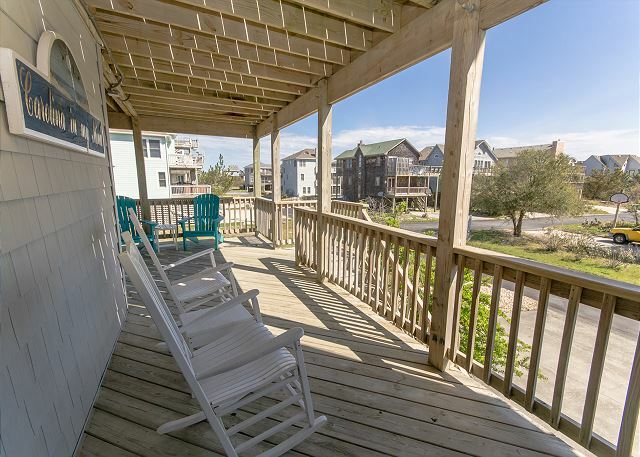 Guaranteed to have all the comforts of home and a short 5 minute walk to beach. Neighborhood is great for riding bicycles, or taking a walk in the evenings. Ample space for a large family to spread out indoors / out and have a restful beach experience. Wonderful home & location. Rental agency employees were very good to work with. Have used this agency & rented the same home four times already. Will continue to call them in the future. We were looking for a house for our entire family to stay together. This house was perfect. For being a pet friendly house, it was extremely clean, which is important because my daughter is allergic to a lot of animals. The beds were really comfy. The mid-level deck was really enjoyable. We spent a lot of our non-beach time there. Always a nice breeze. The kitchen was perfectly stocked. The owner called us directly to make sure everything was ok. We had one thing break during our stay and maintenance was there in 15 min to fix it. We went to the 4x4 beach and saw the horses. We also went to the new water park, which is great == H2OBX. Definitely would recommend this home. My family of 7 and a dog along with grandparents in previous years and cousins and friends have rented this wonderful cottage every summer for over 15 years since it was new. The owners maintain it meticulously. The kitchen and great room are gorgeous and there are decks on 3 sides with a hot tub with both ocean and sunset views. We love to sit out on starry nights! There is a lower level deck with a hammock and hammock swing that are perfect for an afternoon break from the sun for reading or a nap. The kitchen is as well-furnished as ours at home so that cooking gourmet meals --as we like to do--is a pleasure (e.g., sharp knives, garlic press, cuisinart, beautiful dishes and glasses, etc.). there is a new gas grill with extra tank (and free refills). The bedrooms are beautifully appointed, there is wifi and internet, and the place is immaculate. The extensive collection of books and videos make it easy to relax. Only a short block to the beach! Close to Harris Teeter and shops. A perfect 10! Thank you for leaving such a lovely review. The owner cares deeply for her property and it shows! We're very pleased to know how much joy this home has brought you and your loved ones over the years. We hope you'll continue to make Carolina in My Mind your go to vacation home. House is great. Owners do an excellent job of maintaining and updating the home. This was our familiy's 20th summer at the Outer Banks. Wish the county would spend some of the high rental tax on improvements in Corolla. Thank you for your review, and returning for your 20th summer!! Carolina In My Mind is a wonderful place to call home, even if only for a week or two! We do hope you were able to enjoy the new pedestrian/bike path added by Currituck County for the 2016 summer -- that's been a big improvement for Corolla, providing a safe environment for guests to enjoy their biking, walking and running. which we definitely used!!! :) we even got greeted with a suprise treat our first full morning! (I won't ruin the suprise for you guys!) but VERY NICE place & would love to stay here again!!!! Thank you so much for opening your home up to us!!!! Thank you for leaving such a nice review. The owners care immensely for their home and the comfort of their guests. We hope you'll return to Carolina In My Mind for another memorable stay. This was our 3rd stay at Carolina In My Mind. As usual, we enjoyed our vacation in this wonderful house. The location is excellent. We have decided that September is our favorite time here...more peaceful and relaxed! September is a great time on the Outer Banks for sure. We look forward to seeing you for stay #4! We consider ourselves very lucky to have found this treasure of a cottage in Corolla and hope to come back again. Great location, everything provided, and spotless. We fully enjoyed our two weeks even if the fish weren't biting. Thank so much for posting! Carolina in my Mind is a fabulous cottage and we hope you'll be back. Excellent house well equipped. Owners have a special touch by delivering a welcome cheese cake. We were with family members with 9 houses rented in section P and ours by far was the cleanest and nicest. We would definitely look to rent this house again. The house was easy to find, and just as described. It was clean, beautifully decorated, and had the most well-equipped kitchen I've ever seen. We were close to the beach, to shopping, to restaurants, and anything else you'd want to do. We visited the Currituck Lighthouse and Nature Center and spent an enjoyable 3 hours. We are so happy this home worked well for you! 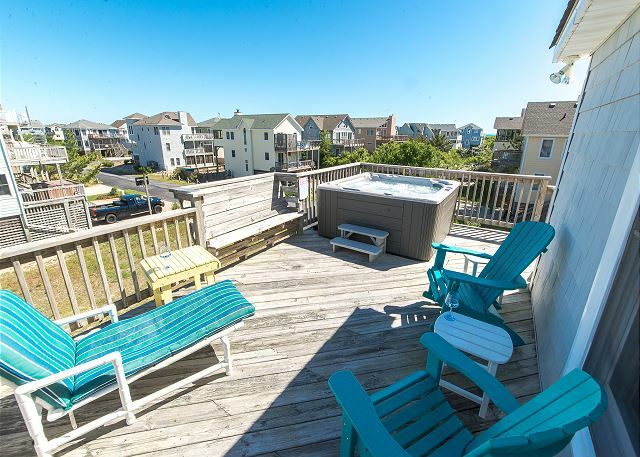 Owners take special care to provide a home with everything you need at the house, and items for the beach, for a wonderful OBX vacation. John, we are always happy to have you back year after year! The owners work so hard to keep Carolina in My Mind in wonderful condition and it shows! We cant wait to see you next year. Rest & Relaxation At It's Finest! Found a fantastic thing and sticking with it.. staying at this well maintained beach cottage for over 10yrs now. 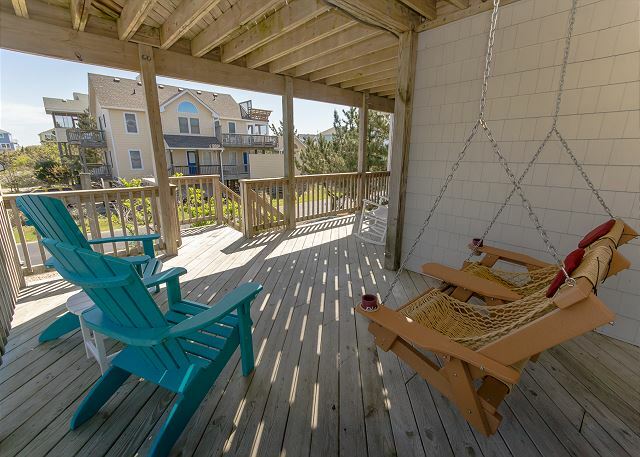 3-4 min walk to the beach sand, the home retains an ocean view and yes you can still hear the waves. Offering comfortable living spaces (indoors/out) for a family vacation and very well equipped for all needs from the kitchen to baby to beach. The home has many games, movies, and books for your reading enjoyment. The home description, layout, and amenities are all as advertised. Checkout the owner's website also (). The owners stay engaged in the upkeep of this home taking great pride in keeping furnishings updated and in great condition for your enjoyment. Every year they invest back into the home to keep it pristine. The owners personally engage the tenants to ensure accommodations meet their expectations and communicate updates to look forward to the next year. 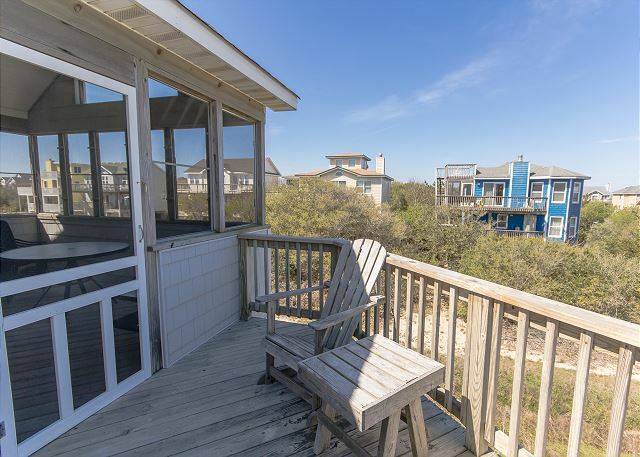 This property should be on your short list as you look for a rental in the Corolla/Ocean Sands area. You will be hard pressed to find a better value in terms of location, amenities, quality of accommodations, and cost than this cottage. If accessing points of interest without driving interests you, a multi-use pathway project is under way to connect the public beach access in south Ocean Sands to Bonito Rd in Corolla along with other improvements to facilities and accessibility to local points of interest. The new pathway will be very accessible from this home. See Currituck Co website for additional info. Thank you so much for your feedback (and kind words)! We look forward to your stay each year! This owner's pride and attention to detail is clear from minute you walk into their home. We agree, the owners are always looking for a way to make the guest experience just a little more special. They care about their guests and want them to have a great stay! Again, we look forward to your stay each year (almost) as much as the owners do. We hope to see you next year. We had a great family vacation in this house. It is well equipped and furnished with a large family room. The beach was great and an easy walk from the house. The whole family enjoyed relaxing on the deck and in the hot tub. Ms. Burrows, thank you so much for your feedback! We love Carolina in My Mind for the same reasons you do! The flow of the house and open floor plan make it a great place to reconnect with family and friends. 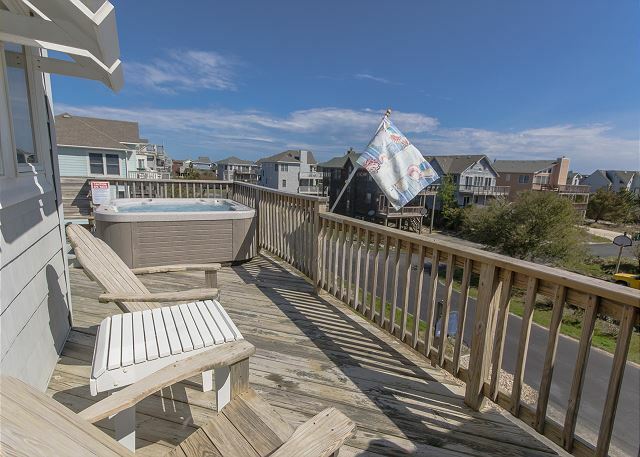 The deck and hot tub are equally as great. On behalf of KHR and the owners, thank you for allowing us to be part of your vacation! We sincerely hope to see you next year! Very relaxing week. Just what we were looking for. Thank you so much for taking the time to leave feedback for us! 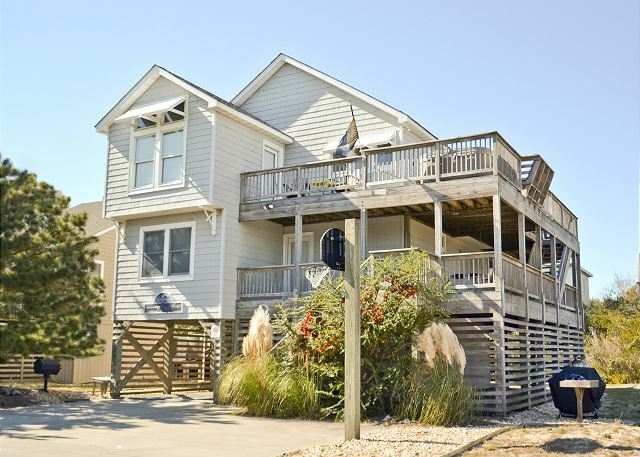 Corolla is so beautiful in September and this home has so much to offer! We hope you found the owner's personal touch throughout the home. We look forward to seeing you next year! This house was one of the best we have stayed in over the years. It is located a short walk to the beach, and also convenient to the grocery store, restaurants, and many novelty shops. The house was comfortable and well equipped with everything we needed. We would definitely stay here again! Janet, thank you for your review. We appreciate your kind words. As you know (from the owner phone call) these owners take great pride in their home and it shows! We certainly hope you will consider us next year for your vacation!